Mural created for Super Bowl venue has a Vineyard connection. Tom Brady’s touchdown passes won’t be the only work of art on display at Super Bowl LIII on Sunday. 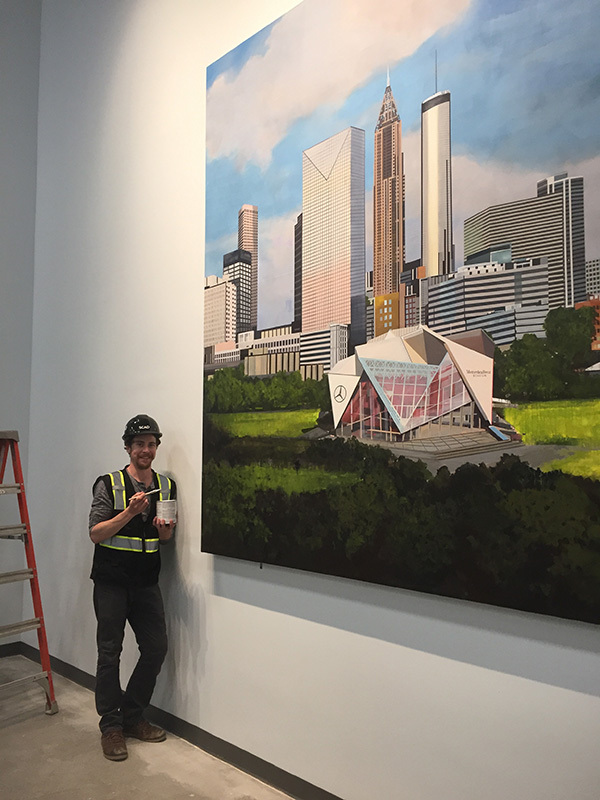 Dan VanLandingham, 33, a West Tisbury artist and New England Patriots fan, is the creator of “The ATL,” a mural of Atlanta’s skyline and the Mercedes-Benz Stadium emblazoned on a 9-foot by 18-foot piece of canvas, which has been hanging on the wall outside Atlanta Falcons and Atlanta United FC owner Arthur Blank’s office in the stadium. The mural is on display ahead of Sunday’s Super Bowl showdown between the New England Patriots and the Los Angeles Rams, which takes place at the newly built stadium. VanLandingham was born and raised on the Island. His passion for art earned him a bachelor’s degree from Green Mountain College, and a master’s in painting from Savannah College of Art and Design (SCAD). He’s also studied painting at Aberystwyth University in Wales. “The ATL” was a 2½-year project that began when SCAD received a contract from the stadium to commission artists to create pieces for the newly built stadium. Along with paintings, the stadium is filled with sculptures and photographs, many created by VanLandingham’s SCAD peers. SCAD reached out to VanLandingham to see if he wanted to create a piece — he gladly accepted. The painting is similar to VanLandingham’s other works, which often feature sweeping contemporary landscapes at the intersection of urban and rural environments. After several months of planning and designing, VanLandingham spent five months painting sections of the mural while he was stowed away at a studio in Chilmark, meticulously crafting each part of the canvas down to the individual windows on the buildings, which were made through a backbreaking process of cutting out small pieces of acrylic to give the mural texture and depth. He then carefully deconstructed the mural, rolled it up, brought it to Atlanta, and spent 12 hours putting it all back together with a team of installers who helped him stretch the canvas and hook up the wiring for a two-foot red neon sign that sits on the mural’s base and reads “The ATL.” He didn’t actually see the entire mural in one piece until it went up in the stadium. The moment the project was completed and the neon sign clicked on, VanLandingham was overcome with emotion at what he had created. “That was crazy. It was like every emotion piled into one. It was like excitement, relief, probably some tears,” he said. VanLandingham completed the project in May 2017, a few months before the new stadium’s official opening, but was only recently given the green light to share it with the world due to a nondisclosure agreement. 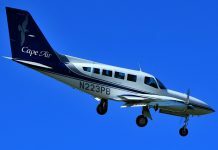 “It was quite the project. When I walked away from it, it was a really good feeling,” he said. VanLandingham got a warm reception from the stadium’s top brass. Blank, who was excited the mural was right next to his office, personally thanked VanLandingham. 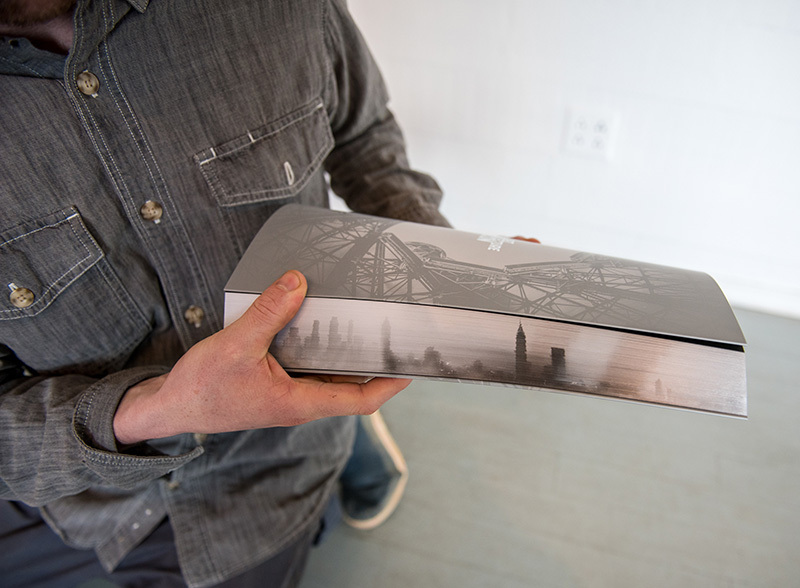 Blank sent out coffee table books to the artists who installed their art in the stadium. The book contains pictures of the stadium in its various stages of development and portraits of all the artists’ work. VanLandingham’s mural got a two-page spread. Painting the mural was only one part of the project’s process. VanLandingham essentially became a member of the stadium’s construction crew. He had to fill out his fair share of paperwork, take construction safety training, and was required to wear a hardhat, safety goggles, and reflective vest while he installed his mural on the wall. With the project finished and on display for one of the biggest sporting events of the year, VanLandingham is excited, but also ready for what’s next. VanLandingham is no stranger to his work being on display. Many of his paintings have been exhibited in galleries in New York, Sag Harbor, and Savannah, and he’s been reviewed in American Art Collector, New American Painting, Art Business News, the New York Times, and, locally in Arts & Ideas. 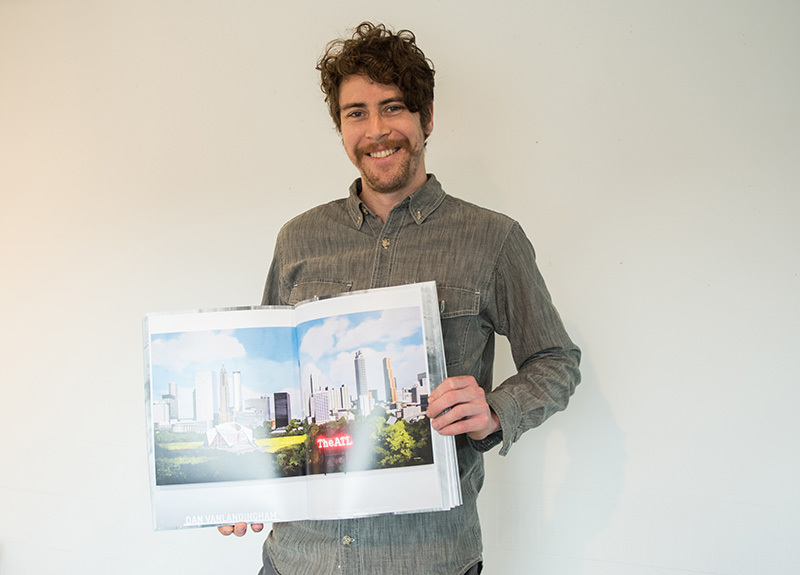 He hopes “The ATL” will continue to lead to more opportunities for big projects. 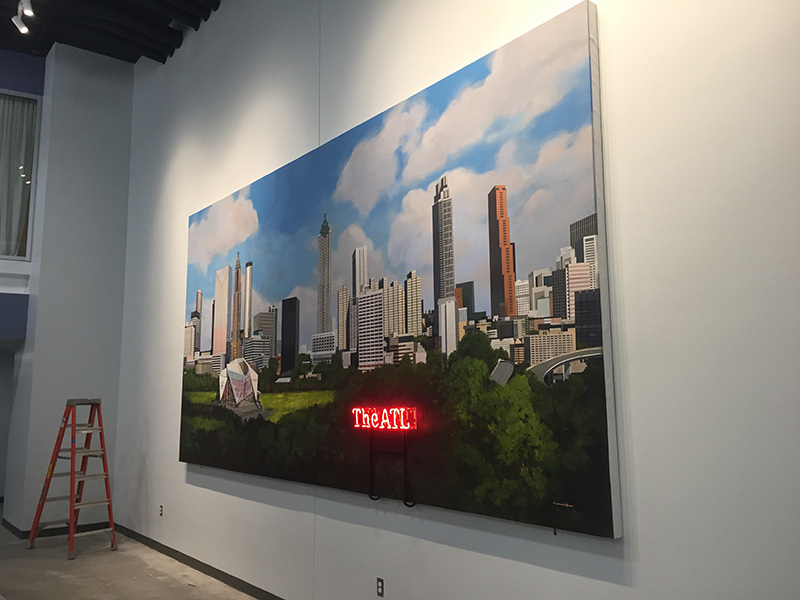 VanLandingham tries to do one big project a year like “The ATL.” He’s in transition to a new studio on the Island, but once he’s settled in, VanLandingham will begin work on another painting through SCAD — a skyline mural of Hong Kong for its Hong Kong campus. Hockey is VanLandingham’s favorite sport, but he is a Patriots fan through and through, and will be rooting for them on Sunday. While he doesn’t have tickets for the big game, he takes comfort knowing his painting has a permanent place in the stadium.